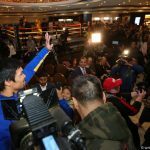 LAS VEGAS – Manny Pacquiao and Adrien Broner made their grand arrivals at the MGM Grand, officially kicking off fight week ahead of their clash this Saturday on Showtime pay-per-view. 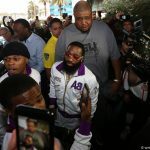 Broner (33-3-1, 24 knockouts) arrived first as he played to the crowd and showed off his bling as he seeks his first win in three fights after a decision loss to Mikey Garcia and a draw against Jessie Vargas in his last two outings. “I’m just excited I’m the underdog and I know there are a lot of people that are here to see me lose. This is my second fight with my trainer Kevin Cunningham and we brought in strength and conditioning, so we good. You’ll see so on January 19,” said Broner. Pacquiao (60-7-2, 39 KOs), who is fighting for the first time in Las Vegas since 2016, was excited to be back in front of the crowd. 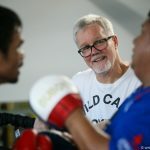 The Filipino boxer turned senator says his age, and those questioning whether he still can fight at the elite level, are motivating factors as he heads into the fight. 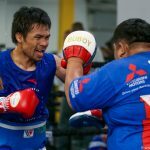 “Forty is just a number to me,” said Pacquiao, who rated Broner a 7 or 8 as a fighter on a scale of 1-to-10. 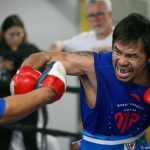 Pacquiao is coming off his first knockout win in nine years, having dropped Lucas Matthysse three times en route to the seventh round stoppage. He says the feeling of scoring knockouts has become addictive, but has learned to listen to his trainers and hold back from overtraining by doing fewer rounds in the gym and allowing his body to rest and recover. “I want to leave a legacy in boxing until I’m going to retire. 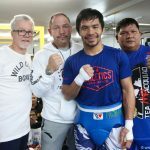 I want to still be a winner until my retirement,” said Pacquiao. 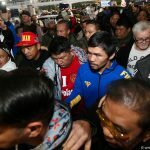 Here are photos of Pacquiao’s arrival and workout by Team Pacquiao photographer Wendell Alinea. 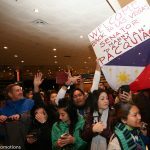 The post Photos: Manny Pacquiao makes grand arrival, trains in Las Vegas appeared first on The Ring.